Booking a taxi is really easy. Click on the origin. Then, click on the destination icon. 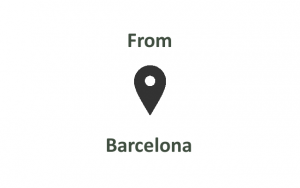 The icons FROM BARCELONA or TO BARCELONA includes any address in the City. Later you will have the possibility to specify the point of origin or specific destination where you will need your taxi. Steps 1 and 2 provide you the information that you need to book your transfer properly. Now, it is time to book your transfer. Please, select your pickup address and drop off point. Then, purchase your transfer depending on the car you requested and pay safely via PayPal or Credit Card via Stripe. It will appear a window with the header “Order Received” with the Order Number. Please, keep this number because it will be necessary to modify or cancel your service. You will need a copy signed to deliver to the taxi driver in the meeting point as receipt. Please, remember!, You can cancel or modify your transfer up to 60 minutes before the pickup time with no additional charges. If you need to cancel or modify your transfer contact us either by e-mail at cancel_modify@bookingtaxibarcelona.com or telephone at +34 933 12 80 50. Please, if you cancel or modify it by e-mail, pay attention to the Order Number in the e-mail subject. WhatsApp is not available to cancel of modify services. After booking your transfer, you should receive a confirmation e-mail within 1 hour. In any case, do not worry. Your transfer has been purchased successfully. Whatsapp is available only to communication with the Booking Department in the event of lost luggage, injuries, holding in customs or not located driver at the meeting point. . Important: We strongly recommend reading FAQ before reserving a transfer. Please, read the FAQ by clicking here. Remember that you can cancel or modify your transfer minimum of 1 hour before the day of your first scheduled transfer without any extra cost. The full amount of the purchase will be refunded via the same payment method used in the purchase of the transfer. – Via telephone calling at +34 933 128 050 at any time, every day of the year. – Via email at cancel_modify@bookingtaxibarcelona.com at any time, every day of the year. – Via Whatsapp at +34 620 987 948 at any time, every day of the year. Whatsapp is available only to communication with the Booking Department in case of a member of the group loses a part of the luggage, is injured, is being held in customs or not locate our driver in the meeting point . To cancel or modify a transfer, Whatsapp is not available. Always making mention to the “Order Number” in the mail subject, starting the text of Whatsapp or beginning the conversation with our Booking Department. This number appears when you purchase your transfer and must to have a copy signed to be delivered to the driver in the meeting point as receipt that the transfer was made. Important: We strongly recommend you that before buying a transfer carefully read the FAQ which you can access by clicking here.